"There is also a Partill or Platick aspect: Partill aspect is when two Planets are exactly so many degrees from each other as make a perfect aspect: as if Mercury be in nine degrees of Aries, and Jupiter in nine degrees of Leo, this is a Partill Trine aspect: So Sun in one degree of Taurus, and Moon in one degree of Cancer, make a Partill Sextile, and this is a strong sign or argument for performance of anything, or that the matter is neer hand concluded when the aspect is so partill, and signifies good; and it's as much a sign of present evill when mischief is threatened." 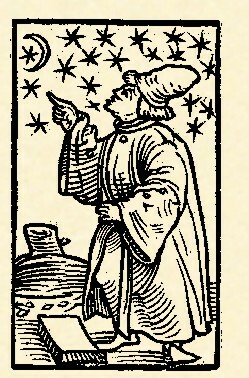 "A Platick Aspect is that which admits of the Orbs or Rayes of two Planets that signifie any matter: As if Venus be in the tenth degree of Taurus, and Saturn in eighteen degrees of Virgo, here Venus hath a Platick Trine, or is in a Platick Trine of Saturn, because she is within the Moity of both their Orbs; for the Moity of Saturn his Rayes or Orbs is five, and of Venus 4, and the distance betwixt them and their perfect aspect is eight degrees..."
So, partile does not mean less than a degree away, it means that the planets are both in the same degree of the sign they are in. Ok, Lilly mentions partile and platick, I have students learn it in the course, but what does it mean? This raises the issue of what I call "fossilized" technique in traditional astrology. Traditional astrology, not surprisingly, is very respectful of tradition and what has been passed down from earlier practitioners. Traditional astrologers did not simply toss out technique when they didn't understand it or didn't use it. Arabic astrology, which is the basis of traditional European astrology, was much more complex and so there are lots of things the Arabic astrologers used, which the medieval and Renaissance astrologers knew about and might even mention, but then didn't use. Partile and platic or platick aspects are one such fossilized technique. Lilly mentions them, but I don't think he ever really uses them in a delineation. What I would say is that with applying aspects the closer you get the stronger, or the quicker, so clearly a partile aspect is very strong or very quick. as for example, A Question is proposed of some weighty and difficult business, whether it will be done and brought to pass or not? And 17 degrees of Scorpio Ascends, and Mars is 12 degrees 13 minutes of Taurus, and Venus in 12 degrees and 14 minutes of Capricorn, so that Venus is joined to Mars by a Trine, and receives him in her House, who likewise receives her in his Exaltation; so that the Querent thinks, and all others concerned verily believe, that it would be accomplished by that aspect of perfect friendship; in which flattering hopes they continue till Venus hath passed the Aspect of Mars one whole degree; but at last the business comes to just nothing at all, because Venus was past Mars one minute at the time of the question proposed. Yet may a thing possibly in such a case be brought to pass, but not without extraordinary labour and trouble. " I've seen situations where we have a separating aspect of less than a degree, and the asked for thing was perfected, but with a huge hassle. So as traditional astrologers, we frequently encounter technique that we don't use or often don't fully understand, but just because we don't understand it, we don't simply toss it out. We respect the tradition and often, when we delve deeper, we find for ourselves the wisdom and deep experience of our predecessors. This is part of what it means to be a true traditional astrologer as opposed to a modern astrologer using dribs and drabs of traditional technique on an unconsciously modern overall methodology. I wanted to talk a bit about essential dignity scoring of talismans. As you look at talismans on my website you can see that they have different point values. These come from adding up the essential dignity scores for the planet at the sign or degree it was at when the talisman was made. Sign = +5, exaltation +4, triplicity +3, term +2, face +1. It is possible to have multiple dignities and thus to get greater than +5. For example we have a new Mercury +10 talisman. Mercury is dignified by sign +5, exaltation +4 and face +1, for a total of +10. It does sound very impressive to have this Mercury +10 because we have multiple essential dignities and it does indeed boost the strength a bit. However, just looking at the essential dignity score alone is too simplistic, particularly when I've had clients turn up their nose at talismans and say, "I won't take less than +10" The problem here is that for many planets it is impossible for them to have +10. The Sun, for example, we have trouble getting less than +7 and it's basically impossible to get more than +8. Refusing anything other than a +10 Sun talisman means no Sun talisman at all! Secondly, the scale of the points doesn't reflect their effectiveness accurately. (face) +1 is very weak, almost not worth doing. (triplicity) +3 is actually pretty good. +4 (exaltation) is all you ever need in a talisman. +8 on the other hand, is stronger, but is not twice as good as +4. This is because we are not charging batteries, what we are doing is trying to contact and keep a good relationship with the spirit of the talisman. The power of the talisman is more like the quality of a phone connection. +1 and you have a super staticky line you can't hardly hear the other person. By the time you get to +4, this is like a good cell connection, no problem for a conversation. +8 is like using a T3 line for a phone call, maybe even overkill. So, while it is nice to say Wow! +10! and yes, it's good, exaltation (+4) is really all you need for an excellent talisman. It is nice to have the extra points, and worth the extra effort to make them and the cost, but refusing a talisman because it is JUST dignified by sign or exaltation, is like telling your friends you won't talk on a cell phone, you only use a T3 line!